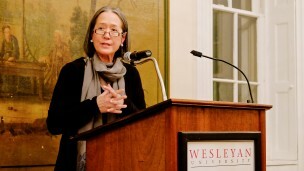 Novelist Ruth Ozeki visited campus on April 8 to discuss how her writing process is influenced by her experience as a novelist, filmmaker, and Zen Buddhist priest. The acclaimed writer Ruth Ozeki, the latest guest lecturer of The Russell House Series, visited campus Wednesday, April 8, to discuss how her writing process is influenced by her experience as a novelist, filmmaker, and Zen Buddhist priest. “A Tale for a Time Being” features two central characters. The first is Nao, a bullied young girl living in Tokyo who is contemplating suicide and chooses to journal the story of her 104 year-old feminist, anarchist, Buddhist nun grandmother as her last act of redemption. The other, Ruth, is a fictionalized version of the author herself. The 2013 novel took five years to complete—and it wasn’t until the last version that Ozeki’s fictional counterpart made an appearance in the text. Ruth discovers Nao’s journal after it washes up on the shore of her home island off the coast of British Columbia. Ozeki revealed that her first spark of inspiration for the book came to her through the voice of Nao. She wrote the book over five times, each with a different reader of Nao’s journal, before settling upon herself. Throughout the evening, Ozeki emphasized the role her faith plays in facilitating her writing process. She was first introduced to the concept of “time beings,” which she explores in her latest book, through the teachings of Japanese Zen Buddhist, Dogen. She described the reconciliation between fictional Ruth and real-life Ruth as a philosophical game toying with the Zen principles of interconnectedness and no-self. Ordained as a Buddhist priest in 2010, Ozeki relates meditation and writing as two very similar skills. Balancing these two aspects of her life was not always easy, according to Ozeki. At first she struggled with managing both the mental discipline of meditation and the racing thoughts typically found in the mind of a writer. In her early years of meditation, she often worried about losing ideas that came to her at a time when she was unable to write them down. However, she has been able to find peace of mind in the prospect. She spoke to the role of writers in a more global context. Ozeki also cited her past work in the film industry as a huge contributor to her growth as a writer. “I learned how to write novels and tell stories,” she said. Ozeki further added that her film background lends her other writing skills, such as a sense of montage and the ability to manage time in a novel. Ozeki’s visit produced a full turn-out with a positive response from the crowd at both Russell House and Allbritton. The event marked the annual Annie Sonnenblick Evening, in honor of Sonnenblick ’80. The evening was sponsored by the Sonnenblick family, with Annie’s mother Linda among those present. The crowd consisted of students and professors from different departments, including religion, philosophy, and history. “It really suggests the range of disciplines that her work attracts,” Greene said. Ozeki’s reading of an excerpt of her novel prompted laughter one minute and solemn nods the next.